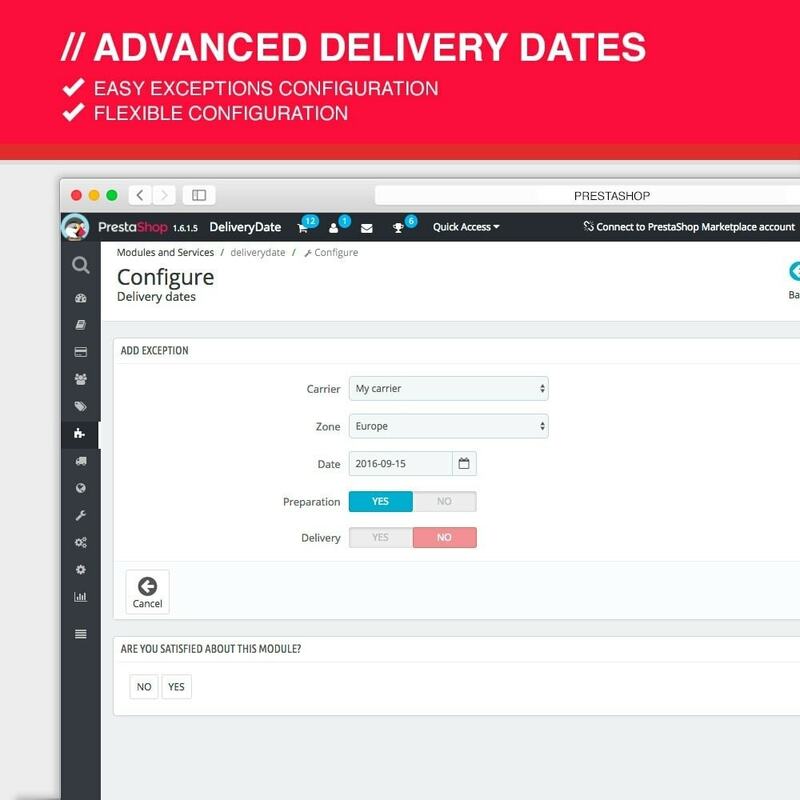 In a context that aims to protect the consumer, this module allows you to display estimated delivery dates before the customer closes his order. 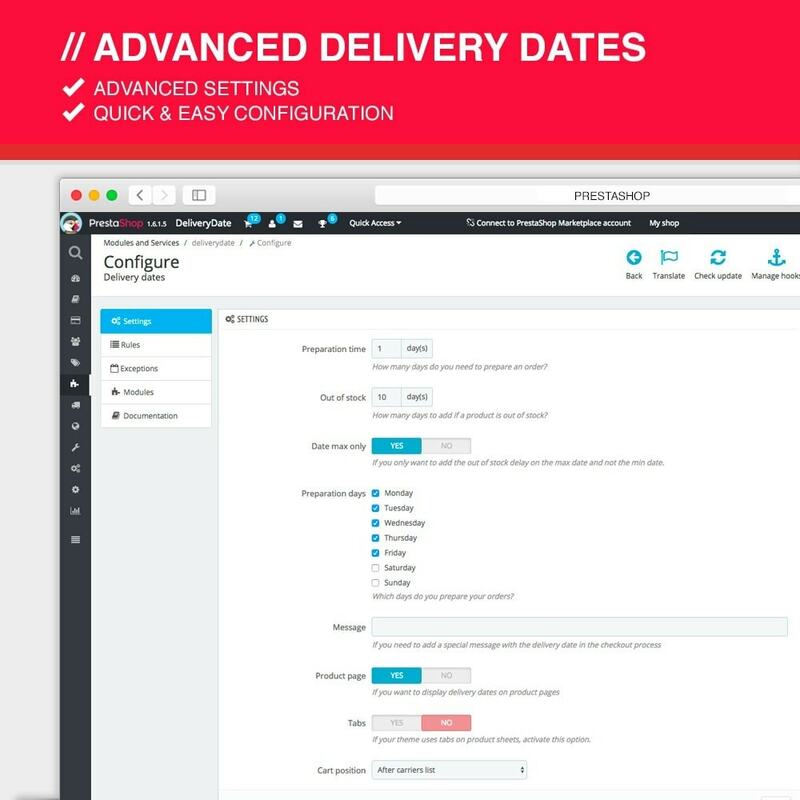 This module gives you the opportunity to tell the customer an estimated delivery date or estimated delivery in-between two dates, for each order. This(these) estimate date(s) will be displayed both in the product sheet of each item and in the CheckOut tunnel. Several settings will let you refine the(se) estimate date(s) : preparation time, extra-time for out of stock items, preparation days, delivery days etc. Everything is meant to be personalized by carrier and delivery zone. Choose where you want to display the dates : In the cart, you can choose to display the estimated delivery time before or after the carrier list. 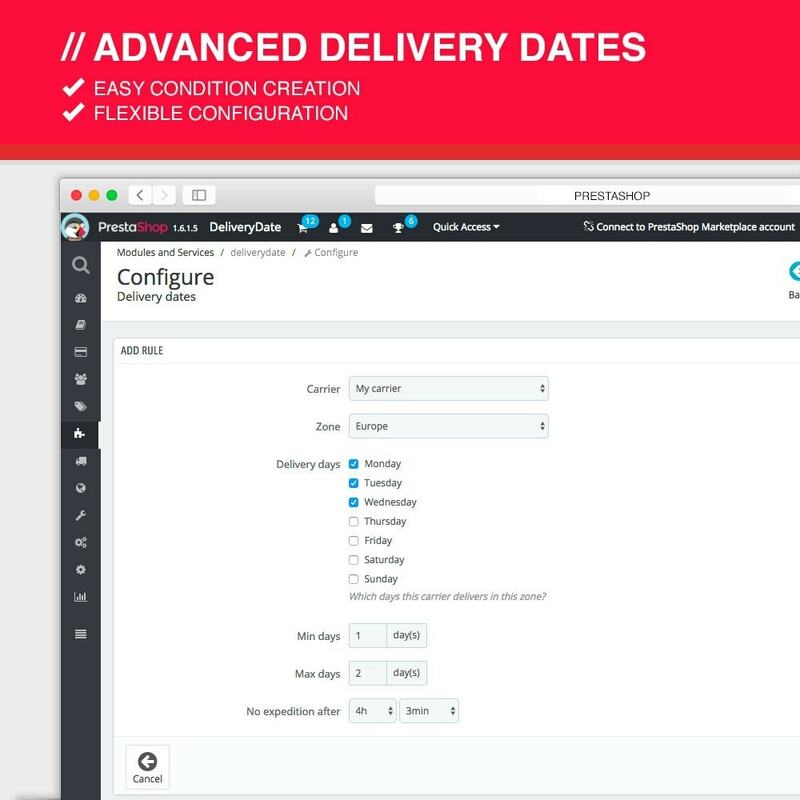 Estimated delivery dates are displayed in the product sheet : You can choose whether to display the estimated delivery dates per carrier in the product sheet or to hide them in the product sheet. 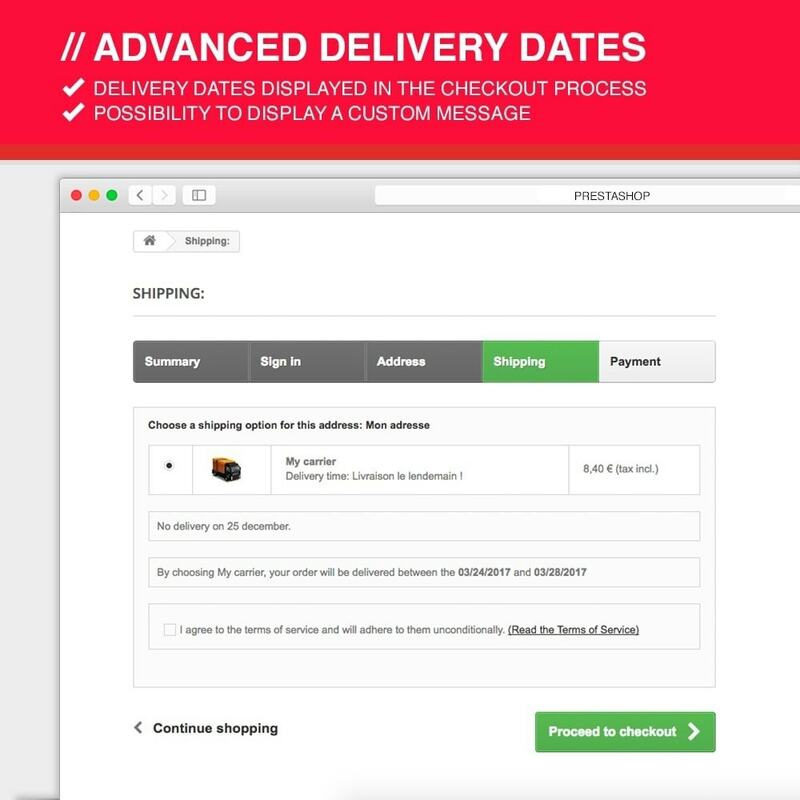 Estimated delivery dates are displayed in the customer account : Customers can see the estimated delivery dates which are linked to they order in their customer account, in the order resume. Estimated delivery dates are displayed on the invoice : The estimated delivery dates are also displayed in the invoice sent to the customer. Apply a personalized message addressed to the customers : You can add a personalized message for the customer in the cart. For instance, "Because the Christmas time is really busy for us, the delivery time can be delayed". 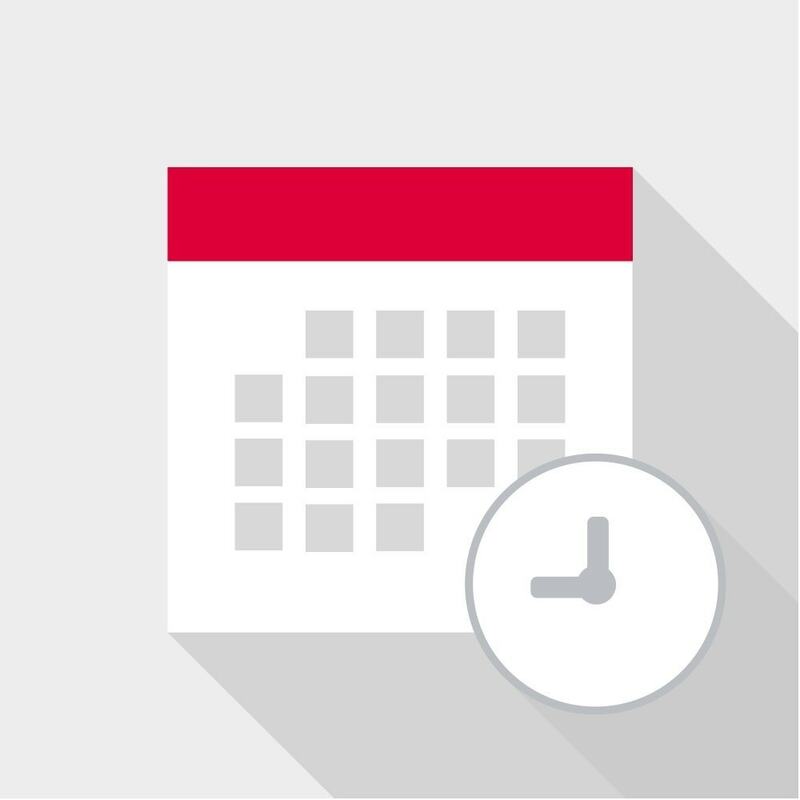 Preparation time settings : You set up the preparation time and the preparation days per carrier in order to display the reliable estimated delivery dates to the customer. You can also all preparation delay for out of stock products. 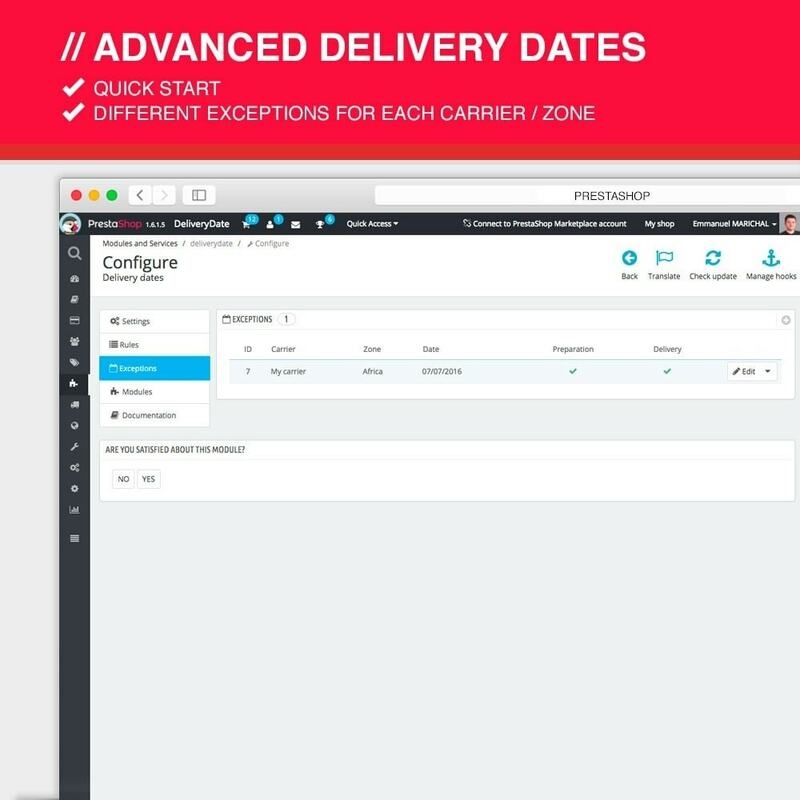 Delivery time settings per carrier : You do the settings per carrier and per delivery zone : you indicate delivery days and minimum & maximum delivery delay. You can choose the maximum time of order for which the order date counts for a delivery day. Exception handling : You are able to set up exception days with no delivery and/or no preparation. For instance, "no delivery on Christmas day, January 1st etc.). 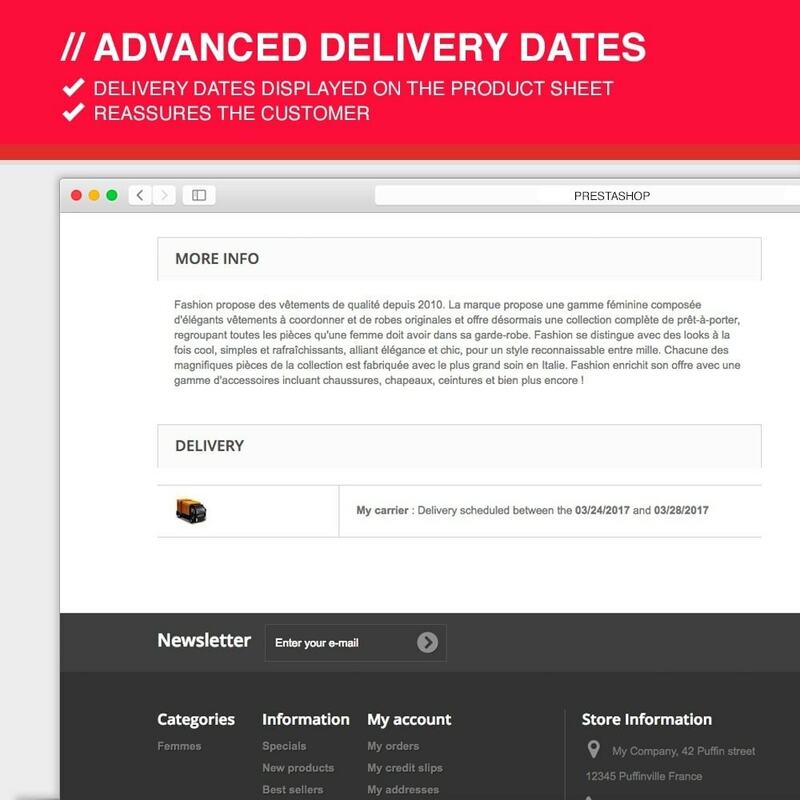 Estimated delivery dates are displayed in the back-office : The estimated delivery dates told to the customers are also displayed in the back-office, on the order page but also on the invoice. Reassure your customers by displaying estimated delivery dates in both the product sheets and the CheckOut tunnel. Your customers will be able to see the delivery time per carrier. A reliable information which stimulates customer to buy products from you shop. The key asset of your online shop ! Installation and configuration are very simple. Comprehensive documentation is also available to guide you step by step, without forgetting that I am available if you have any questions.